Are you more “task oriented” or “people oriented?” Are you more outgoing or reserved? What about your staff and patients? How are your interactions with them? About 10 years ago, I was exposed to the DISC model of human behavior. Since that time, I have made it my mission to not only “see patients” but to connect with them, and to not only “have coworkers” but to understand them and how they see things differently. Because of the DISC model, I have been able to avert many negative situations and misunderstandings on the job. You can too, if you learn to apply the information that I am about to share with you. I work at Bodyworx Physical Therapy in Wichita, Kansas. Physical therapy—like many medical specialties, including radiology—can be broken down into two basic areas: tasks and people. The task side includes technical schooling, learning about diseases, exercise and modalities, along with how to run a business. As physical therapists, we get training in all of these areas. The people side includes greeting and working with patients when they step through your front door and interacting with coworkers, insurance companies and physicians’ offices. How much training do we get in working with people? What about the lost art of good people skills? When I hear others talk about a “problem relationship” within the workplace, it is usually because they don’t understand the other person’s personality style, and the other person often gets labeled as noncompliant or not on the team. When Hippocrates studied people 2,400 years ago, he noticed differences in behavior that seemed to follow a pattern. Many people have studied this pattern until William Marston defined it in 1928 when he wrote, “The Emotions of Normal People.” Based on his research, Marston developed the lie detector test that is still in use today. Marston talked about how people are motivated by four intrinsic drivers or patterns that he called DISC. He defined characteristics and measured them in words that are objective and descriptive rather than subjective and judgmental. In the age of evidence-based medicine, this data has proved to be nearly 90% accurate. So, how is the pattern of people and Marston’s research applicable in today’s clinical setting? Each of us has an internal motor that drives us. If it’s a fast pace, we are more outgoing; if it’s a slower pace, we’re more reserved. We also have a compass that points us in one of two different directions—either toward being task or people oriented. 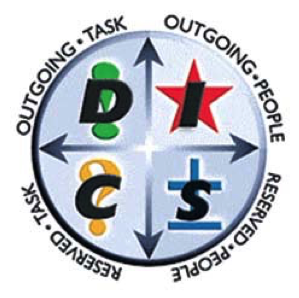 When we put the motor and compass activity models together, we can see that the DISC is a four-quadrant model of human behavior. Let me share an example with you. Recently, I started evaluating a new patient, and I could tell he was mad. From his verbal and body language and detailed description of the problem, I knew I needed to ask one important question: “Have you gotten your questions answered regarding this?” He abruptly said “No!” I asked what his goals were. He told me that he wanted to get his questions answered, know what’s going on and why it’s going on. Because of my training in DISC, I recognized his predominant personality style immediately. He is a “C” personality. He needs quality answers and details and felt that he hadn’t gotten them. I adapted my style and interaction with him accordingly, and by the end of the session he was talking in a much more normal tone. He got all his questions answered. He knew what the plan was and was very thankful. As professionals, I believe we need to adapt our style and learn to say the same thing in a different way so that others can hear what we are communicating. The DISC model of human behavior can help you tremendously in this area. I currently teach this in the physical therapy program at Wichita State University, and the feedback from the students every year is very positive. Their comments indicate that they wish they had been exposed to the information earlier in their schooling. As a certified Human Behavior Consultant, I have provided training for a variety of medical professionals and understand that by improving your people skills, you too can take your care to the next level of success. To keep learning, check out our upcoming calendar of educational webinars. Dr. Doug Bonnesen, MPT, DPT, HBC, works at Bodyworx Physical Therapy, which is a cash-based orthopedic sports medicine clinic in Wichita, KS. He can be reached at drdoug@bodyworxphysicaltherapy.net.